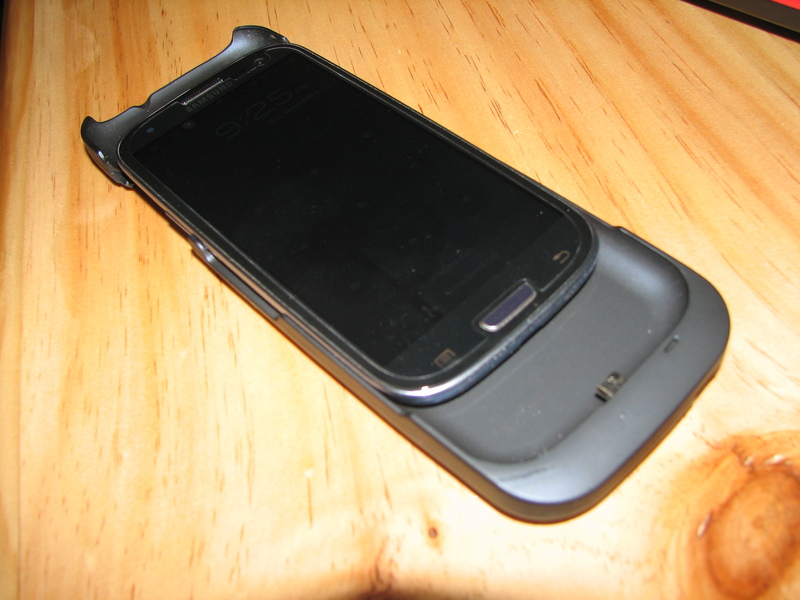 The Droidax Powerpack for the Samsung Galaxy S III is a two in one case that includes an extended battery for the Galaxy S III and is especially designed to perfectly fit its dimensions without adding excess bulk. It includes a powerful, built-in 2300 mAh capa Li-ion rechargeable battery, capable of adding an extra 75% battery time to your mobile phone. The retail pack includes a micro-USB cable that allows you to charge both the Power Pack and mobile phone at the same time, effectively creating an extended battery for the Galaxy S III. In addition, LED indicators make it easy to see remaining battery life levels. A one button smart control ensures ease of use and allows the user to sync data between phone and PC, without having to remove the Power Pack. It also features short circuit and overcharge protection, so you can be rest assured that your phone is well looked after while using the device. As a heavy user of my Galaxy S III, I need a power source that’s going to get me through my day. With the Droidax Powerpack, chances are you can make it through a full day of heavy use without needing mains power. That’s a big claim, and I’ve put it to the test. While there is some extra bulk on your device (a centimetre extra height and an extra 6.2mm thick) with this power pack attached, it’s not cumbersome or unsightly. The pack feels really nice in your hand with a soft rubber touch to it without it feeling sticky like some other similar cases do. The design is really clever, clip your phone into the case and secure it in with the top clip on of the case and you’re done! The electronics in this are quite intuitive as well as being intelligently designed. 4 LEDs on the back of the device tell you the current charge status of the pack with a short press, or turn the charging on and off with a long press. Further, while charging, the power pack allows your phone to fully recharge prior to taking mains power input for itself to recharge. It has clearly been well thought through in its design to maximise battery life of your phone through the day. While it’s not a bad product, there’s a couple of things that bother me slightly. The first (already mentioned) is the fact that you can fairly easily lever the top of your phone out of the top of the pack which could damage your phone if you’re careless enough to push that too far. A lot of if’s, I know, but it’s something that certainly needs mentioning! The second being the fact that this is not a quick way to charge your phone, more a top up while on the run. 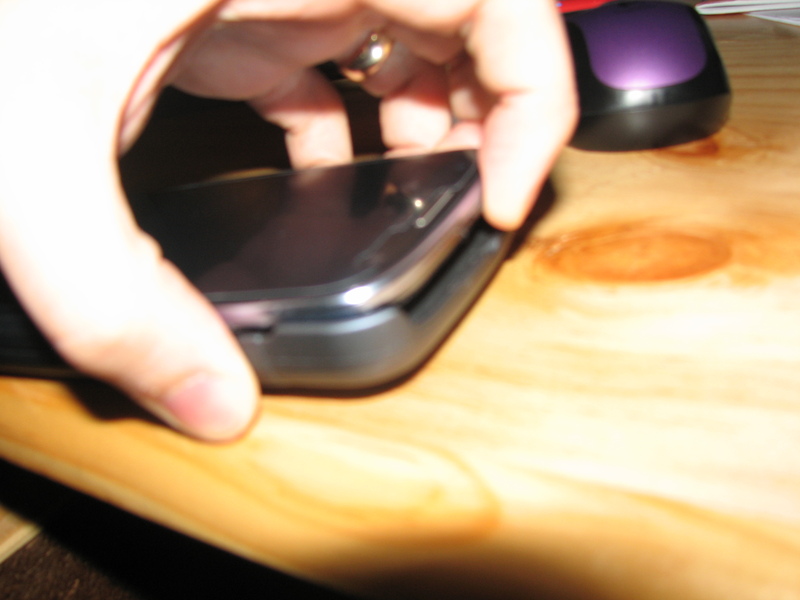 If you wait until your phone is nearly flat, begin charging and then make or take a phone call you are still running the real risk of your phone going flat in your hand. The Droidax website lists the output of the pack at Output: 5.0 + 3.25 V == 500 mA, and while this will certainly (ie. eventually) do the job, it’s not going to compare to the charge times of your mains power charger, nor is it meant to! The heat that a battery pack putting out that much power would generate would be close to painfully hot in your pocket. There is a seemingly endless supply of portable charging solutions out there these days so we’re certainly not going to tell you that this is the only one for you. Nor are we going to tell you it’s the most versatile. It is however, one of the most convenient that we’ve come across for people that only need to charge their phone. If you’re looking for versatility and value, the Portacharge by Droidax is certainly leading this list. The Powerpack really excels when you’re away from mains power, or can’t afford to have your phone out of your pocket on some kind of charger. If you’re on the run, or frequently mobile, then the Powerpack will deliver the goods all while your phone is in your pocket. We’re keen to get your opinion on the Droidax Powerpack too. Then please send an email to us at [email address=”competitions@ausdroid.net”] for your chance to win one outlining why you’re a perfect candidate (50 words or less) to review the product and if you’re chosen, you can keep the device when you’re done, we’ve got 3 of these to give away – 2 white and 1 blue so please specify which you would prefer in your email. For $49 this really is a very good product, you simply need to be aware of it’s limitations in the speed it charges your phone and the design flaw that could cause you much grief if you damage your micro USB port. The feeling of the product is quite frankly, slick! It feels great in your hand with a lovely rubber feel without being sticky or cumbersome. The power pack does add some size to your device, but if you don’t have access to mains power all day, in the battle of convenience of power vs size… Power will nearly always win. Looks like it would be ideal in many situations and "not bad" in others. I'd love to try it out as I work 12 hour shifts and can be away from power for long periods of time. Access to the power switch may be helped by a"massage" with a small file? Great review, now I really want one!!! !